East segment - This segment is funded for construction in 2003. See the map. Southwest segment - The route was finalized in August 2000. See the map. Overall Map - This map is from the official Grand Parkway website. 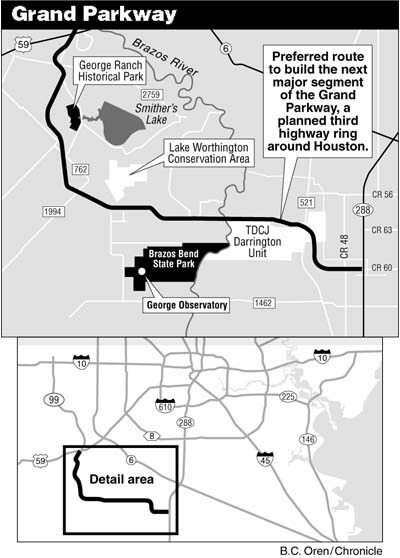 28-June-2001: The Texas Transportation Commission approved $7.5 million for location studies, environmental studies, and design of a 16.2 mile segment of the Grand Parkway from Texas 288 to State Highway 35. This is a big step forward for the south segment, which is about half of Segment B as described on the official Grand Parkway web page. With this study, about 70% of the Grand Parkway is either built (west segment), funded (east segment), has its route defined (southwest segment), or is in the route determination/ environmental process (northwest, north and south sections). 29-March-2001: The Texas Transportation Commission provided $28 million in funding to construct two interchanges on the planned Westpark Tollway. Most of the money will to towards the interchange at the Grand Parkway, which will be in the vicinity of FM 1093. 17-March-2001: Alignment options for north section of the Grand Parkway are highly controversial. See the news article. December 13, 2000: The Houston Chronicle published an article in which one of the members of the three-person Texas Transportation Commission speculated that I-69 will follow the route of the Grand Parkway around Houston. A final decision will probably occur around 2004. See the article, "Highway official envisions merger of I-69, parkway". November 16, 2000: The Grand Parkway Association gave its annual report to the Texas Transportation Commission. Read the text here. There was a tremendous amount of progress in year 2000, and no setbacks. November 2000: Alternative alignments for the 52 mile stretch across North and West houston are now online at the official Grand Parkway Web site. There were posted around November 30, 2000. November 7, 2000: Fort Bend County (southwest of Houston) approved $86 million in road bonds. This proposition includes $7.3 million earmarked for detail design and final environmental work for Segment C. An additional $2 million is earmarked for design work for interchanges on the existing segment of the Grand Parkway from I-10 west to US59 south. These interchange/grade separations will upgrade the existing facility to a full freeway. No timetable for construction at this time. Also on November 7, Fort Bend County voters also approved $140 in toll road bonds for the extension of the Westpark Tollway to the Grand Parkway and construction of the Fort Bend Parkway Tollway, which will ultimately extend to the Grand Parkway. Segment B, which is between I-45 south and 288 south on the southeast side of Houston. Originally proposed in about 1965, the Grand Parkway was officially part of Houston's master freeway plan in the 1960's and 1970's. In 1976, the Grand Parkway was deleted from official plans as reported in the January 1977 Newsletter of the Regional Transportion Plan: "Deletion of certain elements from the system, mainly the Grand Parkway, has reduced the ultimate planned system from 1000 miles to nearly 900 miles." However, the 1978 freeway planning map still shows the southeast section of the Grand Parkway between SH35 near Alvin and TX146 as a "proposed noncommitted facility." In the 1980's, the Grand Parkway was brought back to life. I'm not sure exactly when it was restored to the official Houston freeway plan, but it re-appears on a freeway planning map dated January 1, 1985. Houston's real estate community was instrumental in reviving the Grand Parkway. 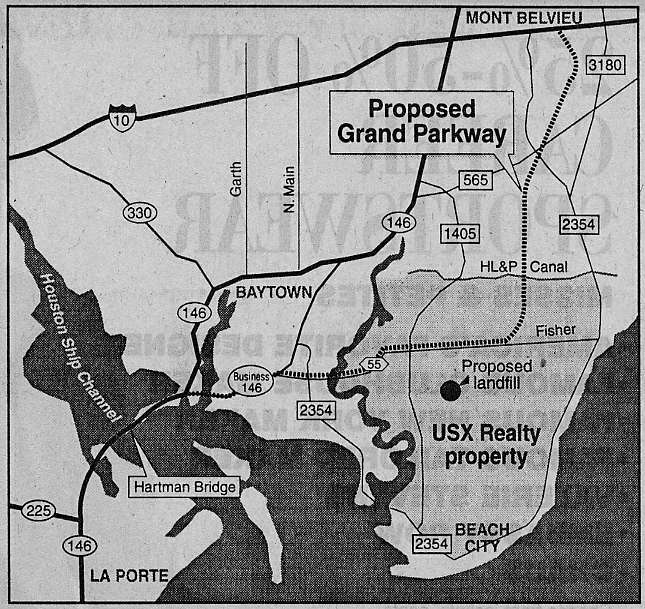 The Grand Parkway Association was formed, mostly by real estate interests. The Association was intended to be privately financed, with the task of performing all preliminary work required before construction could begin, including route studies, environmental studies, obtaining right-of-way, and engineering. The Association has been instrumental in keeping the Grand Parkway moving forward, but they've needed a lot of financial help from TxDOT and Harris County in recent years to pay for costly environmental studies. As Houston's sprawl has started consuming land near the Grand Parkway, it will be more difficult to obtain land donations. Look for TxDOT or Harris County to take the lead in developing the Grand Parkway in the future. The Grand Parkway will establish Houston as probably the only city with three freeway/tollway loops. The first segment of the Grand Parkway between I-10 west (Katy Freeway) and US59 south (Southwest Freeway) was opened in 1994. About 3 miles of it is a freeway, and the rest is a 4-lane highway on a 300-foot-wide right-of-way with intersections designed to be easily upgraded to a freeway by adding an overpass. Over 80% of the right-of-way was donated. The Grand Parkway is planned to be mostly without feeders, which is unusual for Houston. In the late 1990's, the Grand Parkway gained momentum. Houston's continuously expanding population is making the Grand Parkway a transportation necessity, not just a developer's road to riches. The northern and western segments have been determined to be a feasible route for I-69, and I believe I-69 will follow the Grand Parkway around Houston. The eastern segment of the Grand Parkway is funded for construction in 2003. Nearly all the right-of-way was donated by USX, which owns a huge amount of land in the area that is part of a defunct steel mill. USX also paid for much of the engineering and study costs. USX hopes to develop its land into industrial sites. Timeline Funding is approved. Construction is projected to begin in 2002 or 2003. The Southwestern segment is one of the more environmentally sensitive segments of the Grand Parkway. It cuts through the Brazos River bottomland hardwood forest, near Brazos Bend State Park, and near an observatory. On October 20, 2000, the regional Houston planning commission voted to approved the proposed alignment of the southwest section of the Grand Parkway. See the Houston Chronicle news article of 20-Oct-00 detailing the vote. The Sierra Club is voicing its usual opposition and vowing to continue their fight, possibly with litigation. Most likely, they will not be able stop the project. There are powerful forces working to develop this region, and one of those forces is the Fort Bend County government. 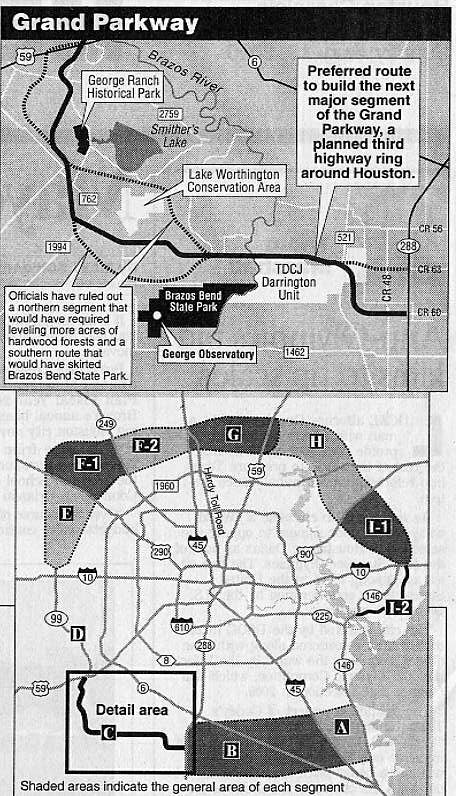 Fort Bend County had been pushing for years to build the 122 freeway from Beltway 8 to the Grand Parkway, and in August 2000 they received authority to develop the facility as a toll road. South of state highway 6, this area is totally undeveloped. There would be almost no one to use the road. Which of course means only one thing: the intent of the 122 facility would be to spur development. One of the main justifications for this segment of the tollway has been the need for a hurricane evacuation route. Of course, if it promotes urbanization (which it probably will), that will be a self-fulfilling prophecy. There is no funding in place to build this segment. There has been talk of making it a tollway, but I don't believe this facility could generate any significant toll revenue. For more perspective, see a 13-August-2000 Houston Chronicle article about this segment. Note: TDCJ is the Texas Department of Criminal Justice. The Darrington Unit is a prison.